It seems it’s a big news day for eBooks and eTextbooks. Google is winding down its eBook service for indie publishers, while Apple and top publishers are the subjects of domestic and European probes into eBook price-fixing. On top of that, Boston-based educational startup Boundless Learning, which is trying to offer students an open alternative to textbooks (and even eTextbooks), is itself on the receiving end of litigation, thanks to three top textbook publishers. But a little litigation isn’t slowing down Boundless, as it today announced that it has closed an $8 million Series A round, led by Venrock — the VC firm that began as the original venture arm of the Rockefeller family. The sizable chunk of pre-launch funding adds to the $1.7 million seed round Boundless raised last year from Nextview, Founder Collective, Kepha, and SV Angel. With the exception of the latter, each of the original investors contributed to its Series A. So, what’s all this hubbub about a company that’s still in private beta? Well, if we told you, we’d have to kill you, Jack. No, but because it won’t be really peeling back the curtains until the start of the next school year, the platform is still evolving. There’s the fact that, since its invite-only beta launched in August last year, the startup has been building its product with limited engineering resources — plus the impending litigation. With its new round, Boundless has been ramping up its development talent, as it prepares to launch a platform for the start of the next school year that aims to connect students to high-quality, open-licensed and free educational content. In other words, through its free learning platform, the startup is curating the best “Open Educational Resources (OER),” and tailoring that content to students’ courses and assignments to provide them with an alternative to spending their life savings purchasing textbooks. And, so far, students seem to be taking to the idea. With its beta reaching thousands of students at over 1,000 universities in the U.S., students rated the Boundless’ platform 50 percent higher than physical textbooks, and the average grade for users was a B+, with 80 percent saying they received grades they wanted or higher. 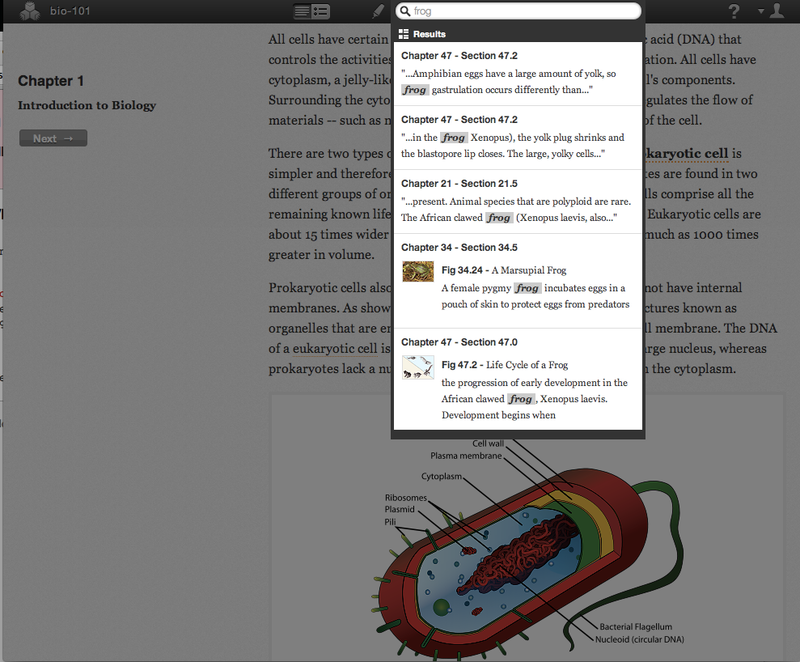 Just as Apple’s iBooks 2 and Inkling’s interactive publishing platform for eBooks before it, Boundless Learning is really aiming to render physical textbooks obsolete. The startup is convinced that an oligopoly of textbook publishers are driving up costs — as 80 percent of the market is controlled by the top four publishers. In fact, as the news today proves, price-fixing among top publishers has become a hot-button issue, and legislation has been implemented to help prevent anti-competitive action among the top publishers. Whether this kind of anti-competitive price fixing is out of financial self-interest or whether it’s due to the high cost of production, updating, and distribution (or some combination thereof), textbooks are expensive, and it’s probably fair to say that students hate it. Many end up opting not to buy textbooks for their courses, and their education suffers as a result. As mentioned, the startup’s open platform has definitely caught the attention of textbook publishers, as the company told us that it received a complaint alleging copyright infringement from Pearson Education, Cengage Learning, and Bedford, Freeman & Worth Publishing Group last month. Boundless Learning Co-founder Brian Balfour tells us that the company thinks the publishers’ claims are without merit, and that it is preparing an official legal statement, with plans to fight the publishers if it comes to that. Really, it’s just unfortunate that the publishers’ first move was not to contact Boundless, but just to proceed straight to litigation. The old “who needs friends when you have lawyers?” approach. In spite of legal issues, Boundless wants to focus on building a better educational (really, course) experience for students. 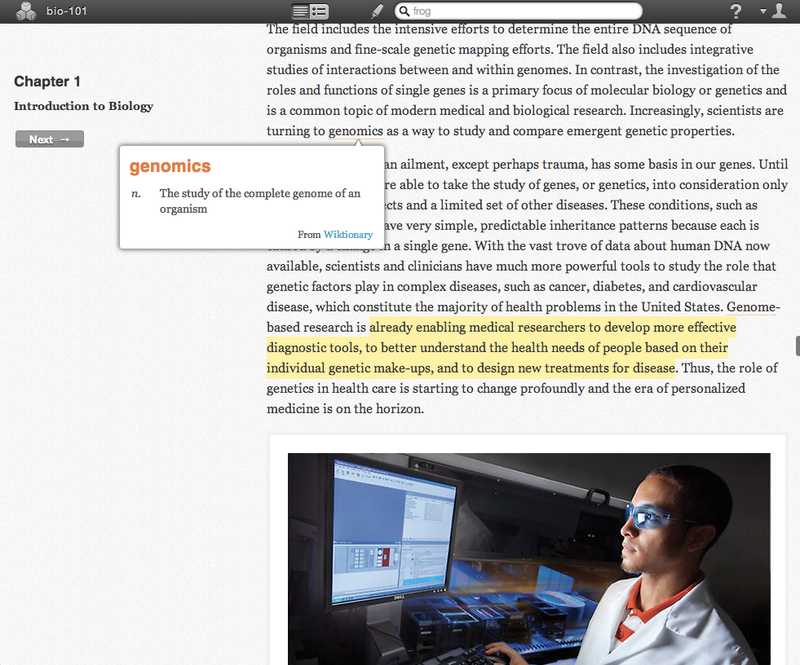 By leveraging OER content, which makes an enormous amount of material, including courses, course materials, content modules, learning objects, collections, and journals available through open-licenses (and is increasingly becoming integrated into open and distance learning), the startup plans to bypass the walled gardens of text books. It then puts that through its own curation process to weed out the bad stuff, before aligning it with student’s individual coursework. Thanks to standardization, especially in first and second year curricula in higher education, this is a little less demanding than it sounds. “Whatever ends up replacing the textbook, it’s not going to look like, act, or feel like a textbook,” the co-founder says. The key is to find a way to present material in a way that students want to consume it, and as they’re increasingly gobbling up entertainment material that is interactive, social, and pushed to them through their online networks, there’s no reason educational platforms can’t steal some of that functionality. In the long run, Boundless wants to break down the long-form nature of textbooks into more consumable, interactive chunks. It wants to have a portal where students go to select their class, at which point it walks them through what they should be studying, how to study it, then pushes that interactive, multimedia content to all their devices. It sounds like something that will resonate with students, even if it’s extremely hard to do. Once the startup has done the legwork that is required to develop this kind of product experience, they want to open the platform up to the community, to let teachers and professors contribute their own material, lesson plans, coursework, etc. After all, the future of educational content is modular, modifiable, interactive, and social. Community contributed content with curatorial oversight can be powerful (Wikipedia, anyone? ), but it’s all about whether or not it creates a more effective and engaging learning experience for students. For more on Boundless Learning, check them out at home here.